We were honored to be included as a trial exhibit in the historic Vergara v. Californiacourt case which, in essence, declared that the unique and powerful job protections that California's public school teachers have long enjoyed ultimately hurt the very kids who could most benefit from great teachers, especially low-income students and students of color, who 60 years later still have not received the equal education promised to them by Brown v. Board of Education. Read more about our small role in this hugely important case here. In our short film, The Blame Game: Teachers Speak Out, several public school teachers explain these policies (tenure, seniority-based placements and "LIFO") and how they negatively impact students, good teachers and school systems alike. We have long needed a transformation of the teaching profession and Vergara could be the turning point that gets us there. Many national leaders, like Washington, DC's Chancellor Kaya Henderson (watch our interview with her on our Youtube channel, TEACHEDTV) have been successfully transforming the profession in innovative ways in their cities and states; Vergara could provide momentum to make those exceptions the norm. Of course those that have been building these job protections and policies into what they are today -- especially our teachers' unions -- are not happy. They will have you believe that making teaching more professional will somehow turn even more qualified people away from the profession; I believe it is the opposite. I know so many professional people who would teach if the work environment were better and more professional. ie, if it required and inspired every teacher to do a great job every day, and held those accountable who are not up to the task. There was a time when the teachers unions fought for job protections that made sense, namely to protect women and teachers of color from discrimination. Federal law now provides those protections to everyone, yet the unions have continued to fight for ever-stronger job protections uniquely for teachers to the point where now, in 2014, it is nearly impossible to fire any teacher without spending thousands of dollars and hours in legal battles, even when there is proof of student abuse! This is insane. But the teachers unions are uniquely powerful, for one, because of their numbers: 3.2 million members in the NEA alone, making it THE largest professional organization in the nation. Secondly, while teachers may not be well-paid compared to lawyers and doctors, compared to many other unionized jobs (farm and factory workers, for instance), they are relatively well paid--they are college graduates after all. This means that teachers unions have enjoyed a lot of steady money coming in from teachers' pockets year after year, and the political influence that money buys (one of the most interesting examples to me is the faux "Op-Ed" the AFT has bought in the New York Times editorial section since the 70s, I believe). And they are not happy when anyone else brings money to the education policy table to fight on behalf of students. As Star Parker explains in this article: Kids Captive of Nation's Teachers Unions, a successful entrepreneur from Silicon Valley funded the legal team behind the Vergara case. The unions say he "bought it" and criticize the support. But if David Welch hadn't had the foresight and generosity to fund this effort, who would have? The poor kids it will benefit? The unions, for far too long, have been able to dictate policy exactly because those who receive the brunt of any negative consequences lack the political power and funding to fight back. I, for one, believe Vergara will usher in a new era of education transformation to turn our system into one in which both students and teachers experience success and joy on a daily, if not hourly, basis. It is time! In a historic ruling yesterday, a Los Angeles Superior Court Judge declared California's laws around teacher tenure, seniority and related policies to be unconstitutional. We are very proud that TEACHED Vol. I was included as a trial exhibit in this case--Vergara v. California--because urban minority students are dramatically impacted by the indirect consequences of these laws. We are also proud that we were able to educate more Californians about the Vergara case through TEACHED interactive screening events, introducing audiences to Students Matter lawyer Joshua Lipschitz, great teachers who explain the policies in question in our short film The Blame Game: Teachers Speak Out, and other courageous leaders like principal Bill Kappenhagen, who became a witness in the case as a result of participating in TEACHED screenings (go Bill!). You can watch Joshua, Bill, Kelly Amis and TNTP's Aleka Calsoyas in this panel discussion at a screening organized by Education Pioneers alumni. If you would like to host your own TEACHED Vol. I screening, go here. We will help you plan a high-impact event. Posted on June 23, 2014 by Loudspeaker Films and filed under by Kelly Amis, Education Equality. Tomorrow is the 60th Anniversary of Brown v. Board of Education, the Supreme Court ruling that required public schools to integrate. Despite the ruling, districts by and large didn't make it happen and by the 70s were ordered by courts to create complicated busing schemes. We know now that this did not work. White parents fled in huge numbers to the suburbs to avoid busing/integration for their children, leaving many cities with high percentages of minority communities. The public school system has mostly failed to provide those urban minority communities with the same quality of educational opportunities as their white peers, and in the early 90s policy leaders of both parties said enough was enough and began to support the charter school concept: public schools that would be independent from school district bureaucracies, free to innovate and more accountable for results. When you hear the charge today that charter schools are responsible for *segregating* students, please question that logic. Charter schools are serving more minority students because that is their mission: to open in under-served neighborhoods to provide a better education for kids that are not being served well by traditional public schools. Our cities are still remarkably segregated; charter schools reflect, but did not create, that truth. See what some of the best urban charter school leaders have to say about why they do what they do (and how they achieve such great results in their inner-city schools) in our short film Unchartered Territory; click on the photo to watch this short film on SnagFilms.com for free. And join us in supporting schools that know and believe every child deserves the opportunity to achieve their full potential, regardless of where they live or the color of their skin. Posted on May 16, 2014 by Loudspeaker Films and filed under by Kelly Amis, Education Equality. Public school systems had been failing for decades -- especially in poor, urban neighborhoods. This is not news. When the idea of charter schools came along-- public schools that would 1) run themselves independently of the bureaucracies that were/are a huge part of the problem, 2) would get to hire their own staff members ensuring 'fit' with the school, AND 3) would be held accountable for results in educating students -- many amazing people stood up and said they would create and run great public schools where they were needed the most. You can see some great examples of these leaders and schools in our film Unchartered Territory. Some not-so-great charter schools have been launched as well. The difference is that when chartered public schools fail, they are required to improve or close; they don't get to keep operating for generations of failure. To argue that charter public schools are taking money from the traditional public school system doesn't make sense; they are a part of the public education system. If parents are choosing them -- and children are benefitting from them- - it's even an odd argument to make. In most cases, the charter schools are spending less but doing more with the funding they receive. How is that possible? Because their funding actually gets into the classroom -- to the school level. It's not sucked up by huge bureaucracries, or to pay salaries of people who are no longer in the classroom but can't be fired due to contract terms, or to work around archaic and indifferent policies that have evolved over time to protect adult interests over the students'. The charter school design is an alternative public school model. Students' lives and future generations of families are being postively impacted by having these alternative schools appearing in their neighborhoods. The question shouldn't be "How do we stop funding from going to the alternative schools that parents are choosing for their children?" but "What do we need to do to streamline and improve the traditional system so that funding and control gets to the school level and is used effectively and in an accountable way in every school"? Moody's Investors Service recently released a report claiming the rise in enrollment in public charter schools could pose a dangerous financial risk for traditional public schools, especially in urban areas with weak economies. Yet blaming charter schools for financial woes in the school district is unfair, and it drives a poisonous wedge between administrators, educators and the broader community, who should be working together to provide kids with access to high-quality education. Public charter schools have long been the scapegoat for traditional public schools' woes. Moody's report follows the usual line of reasoning: charter schools have seen increasing enrollment, which means students are leaving traditional public schools. Because the students are leaving, those schools are losing funding, and they are struggling to stay open. The Moody's report highlights a couple of school districts with serious financial health issues predating charters that are struggling to adapt, but essentially ignores the many other urban districts where public charters and the district are able to grow together and thrive in fine financial health. The simple truth is that the schools that are failing are failing for other reasons, such as counterproductive policies, entrenched bureaucracy and a refusal by stakeholders to work together to find solutions that result in the best education for kids. Outdated policies keep kids trapped in underperforming schools. For instance, hiring and firing policies in 11 states still adhere to Last In, First Out (LIFO), which rewards teacher tenure, not ability or success rates with student performance. Too many underperforming schools are allowed to remain open year after year, draining resources and using up space that could be allocated to schools that actually meet students' needs. It's problems like these that lead parents and students to look to charters for better educational opportunities in the first place. In Newark, N.J., support for public charter schools is overwhelming, with 71 percent of respondents supporting expansion of the sector. These are very real challenges that face many urban school districts across the United States. Slowing the growth of charter schools won't solve the problems, though; it will only trap students in failing schools by taking away viable, affordable options for high-quality education. That's the main point Moody's report seems to miss. The true tragedy of failing public schools is that they're failing our children, who deserve better. While resources and government relations can play an important role, they should never take precedence over the students themselves. It's important to remember that the funds raised through state and local taxpayers for education are dedicated to children, not districts, charters or any particular bureaucracy. Leaders in these struggling communities need to stop pointing fingers and start working together to expand access to high-quality education. Every legislator, bureaucrat, administrator, educator, reformer and parent should be asking how we can provide a system of great schools -- not a great school system -- to best serve our children. Posted on November 7, 2013 by Loudspeaker Films and filed under by Kelly Amis, Education Equality and tagged Education Reform achievement gap charter schools public schools urban education KellyAmis. Today I'm thinking about how and why we got to this point in the evolution (painfully slow as it is) in K-12 education that we need to put so much emphasis on the test scores of students within an individual teacher's room, in a sense to force accountability for good performance from the outside of the school (i.e. we're not increasing the power of the principal to make staff decisions from the inside). Posted on May 4, 2013 by Loudspeaker Films and filed under by Kelly Amis, Education Equality. Every morning I peruse the edreform stories of the day, including in Education Week and the Washington Post. The first two random articles I read today would both get 'D's" in a high school writing class (if I was teaching it anyway, snap!). The first one is about something the new-ish Education Chair of DC's City Council, David Catania, is pursuing in DC. He's hired a law firm to do research and help write legislation that would take all that's happened in DC education to the next level (it sounds like, from the article that is linked to in this essay). The entire essay is based on this generalization stated early on: "hiring a small team of lawyers is the least likely path towards achieving imaginative and effective policy." 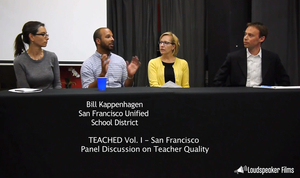 This is the first in what will be a series of personal recommendations for those who watch the TEACHED films and want to get involved in making a difference in their city or state. In honor of UCLA's "Academic Inequality Awareness Week" and our TEACHED Vol. I screening there tonight, I will share some links below to a few organizations that are doing amazing work in Los Angeles and state-wide (and a few national groups). Posted on April 15, 2013 by Loudspeaker Films and filed under Education Equality. Posted on February 1, 2013 by Loudspeaker Films and filed under Media Coverage, by Kelly Amis, Education Equality.